A brief prediction. While idly surfing about the web today, I noticed that Visto, a US-based developer of corporate email solutions, has started a Japanese-language website; there’s no new, startling information, but they’ve translated their product & corporate data, news releases, etc. — presumably, at some cost. Why the big effort? They’ve just announced a deal to deliver push email on Nokia’s new E-series business devices (did someone say “Looks like a Blackberry?”); they are also working with Vodafone in The Netherlands for mobile email. It doesn’t take a great leap of imagination to predict they’ve got a deal cooking with Big Red in Japan. Could Visto and Vodafone, the come-from-behind 3G carrier, have a chance to place a Nokia Blackberry-style device into Japan’s potentially lucrative corporate market, populated by salarymen who have until now disdained ultra-cool email-capable 3G phones for anything other than low-margin voice calls? Until now, only DoCoMo has provided any sort of mail-capable, PDA-type device, and only to mixed results (the devices, notably from Sharp and Motorola, have been rather pricey). December’s shaping up to be an interesting month. Nokia’s e-series devices, announced just yesterday, are aimed at the business market, and feature built-in email access through BlackBerry Connect software as well as VoIP functionality. They run run version 9.1 of the Symbian operating system and the Series 60 smart phone platform. Now what if RIM, make of the Blackberry and associated push-mail software, is too absorbed with arguing a make-or-break patent infringement case at the US Supreme Court, and decided not to enter the Japan market? Nokia and Vodafone would still need the push-mail functionality, and Visto’s product is, apparently, as good as anyone else’s. With Nokia actively working to get more devices into Japan, and Vodafone keen to consolidate their recent return from net monthly losses in the 3G market, it makes sense to offer E-Series devices to corporate customers in Japan — where there is presently little competition in the category. Why not sign up Visto as the partner (hence the company’s new Japanese-language site). The result could be a December launch of a high-end yet still-affordable Nokia mobile email terminal with the cachet that salarymen, older corporate executives and independent business people would love to adopt — in lieu of the consumer 3G devices their teenage sons and daughters wouldn’t be caught dead without. 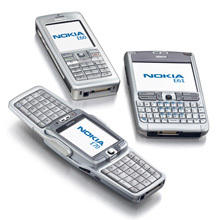 Will 2006 see the genesis of a true corporate mobile market in Japan, courtesy of Visto, Nokia and Vodafone? Time will tell.